Bête has one of the best opening chapters I've ever read. It begins with farmer Graham Penhaligon as he is preparing to kill a cow. Nothing unusual about that except this cow is pleading with Graham (the narrator of this fine story) not to do it. The gift of speech given to animals forms the core of this story, provided by an AI chip that hooks straight into the animals brain. Humankind are ill prepared for how to treat an animal that can talk back, that is by all signs self-aware. After they pass the Turin test a law is passed that prevents any animal that has been "enchanced" to be killed. There have of course been stories before that focus on "uplifted" animals - Olaf Stapledon's Sirius sprints immediately to mind but they are few and far between. Many stories concentrate on mankind becoming uplifted, not animals. Roberts provides a dark vision of Britain coping with such an event, written not just with the authors usual linguistic grace but with a great deal of humour too. This humour is brilliant, never overdone or falling too far into satire it helps to create such fluid prose that it is almost impossible to put the book down. Bête is like sticky toffee pudding, once you begin it is all too quickly consumed. I read it in a few hours of one single day and then wished I had another few hundred pages to read. Narrating the story from the perspective of Graham - an ex-farmer who distrusts creatures who can talk - works incredibly well. His thoughts are lucid and plausible as are his arguments against such technology. Graham is someone who is easy to like and relate to. A life altered by circumstance but also guided by strong moral values. Later there is a certain post-apocalyptic style to the book and I love how this is described on a personal level, through the eyes of Graham. You could be forgiven for thinking that this book is an examination of mans treatment of animals as a food source and this does of course play a part but only a small one. The bigger arguments here are how humanity copes (or fails to) with fast, sweeping changes in technology. How technology can change not how we work but how we live too. The book also examines the very idea of AI and intelligence in general. If an intelligent microchip "uplifts" the intelligence of an Animal, is it really the animal that is speaking or is the animal just a dumb host for the artificial intelligence. Bête is quite simply stunning. Roberts rivals the most elequent of writers, his prose is poetic and yet satirical and serious all at the same time. 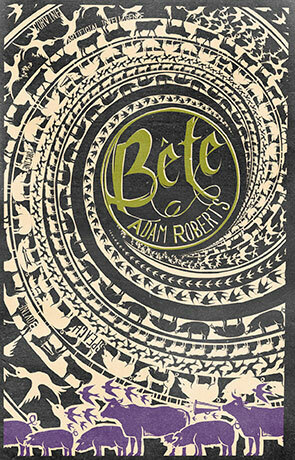 With each book he grows and Bête is the pinnacle of his work so far. It's one of those books that everyone will wish they had written and anyone will love reading. Written on 20th October 2014 by Ant.